The world faces a clear need for innovative biological products to treat and prevent diseases that cause significant health burdens. What might be less obvious is a need for innovation in biomanufacturing processes. If these products are to be made more efficiently and cost-effectively through less wasteful and safer means, then improvements are definitely needed. Despite its continuing need for innovation, the bioprocessing field has not remained static; numerous advances have been made in recent years. Far fewer serum-containing media are used than ever before, for example. Cell culture concentrations and expression titers are going up, while longer perfusion and cycle times yield increasing cell debris in process streams. Sources of viral contamination include process gases and cell banks. Filters are effective for the former; viral screening is usually effective for the latter, at least in regards to specific viruses and virus types for which cell banks are tested. The biggest risk is liquid culture media, feeds, and additives, with their dozens of components from a range of sources. “Sterile does not mean virus-free!” Bushnaq-Josting emphasized. However, it is still necessary to carry out a viral inactivation operation for all biologic products. The best time to do so is just before their use, which reduces chances of reinfection. Treatment options include high-temperature short-term treatment (HTST), which is already widely used in the food industry; C-band ultraviolet (UVC) inactivation; nanofiltration; and gamma irradiation. “I think complete viral eradication will be impossible,” Bushnaq-Josting said. “Whole ease-of-use must be considered, such as plug-and-play to avoid decanting. For example, HTST technology could be introduced between media preparation and hold tanks. It takes up about the space of two pallets.” Two types of HTST technology are available: an established shell-and-tube system from Cotter Brothers/GEA Process Engineering and an electric Actijoule heating process from ABC Actini, which saves energy by heat recovery but is less widely adopted. Validation must be performed on sample metrics because viruses cannot be introduced to actual manufacturing processes. François Champluvier (a scientist working in downstream industrialization at GlaxoSmithKline Biologicals in Belgium) described how his company implemented membrane chromatography as a back-up step for host-cell protein (HCP) removal from a glycoprotein antigen made using Chinese hamster ovary (CHO) cell culture. The antigen is purified using three sequential chromatography steps — anion exchange (AEX), cation exchange (CEX), and hydroxyapatite (HA) — at increasing pH levels. However, the manufacturing process is largely fixed by the time a product reaches phase 3 trials, after which major changes involve repeating phase 1–2 studies. 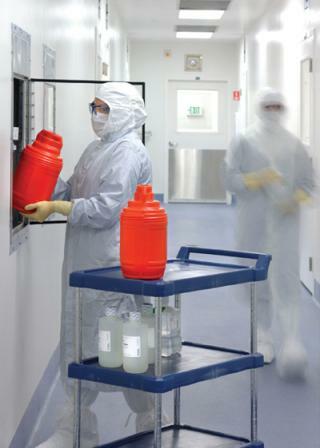 The European Medicines Agency (EMA), for example, requires general information about a plastic container’s composition and specifications, including performance data. For plastics, extraction studies must be done under stress conditions to increase the rate of extraction with an appropriate solvent. Interaction studies must be run under process conditions with an active substrate (using the medicinal product in at least one batch to determine container compatibility) in addition to migration and sorption studies. The overall objective of such testing is toxicological assessment to determine material safety under process conditions. ProMetic Biosciences makes chromatography materials and technology for biologics purification. Chief executive Steve Burton explained that the company’s products include mimetic ligands that are cheaper and safer than biologically sourced alternatives. An affinity capture step in downstream processing uses a product-specific ligand that is particularly useful in manufacturing product variants, for which a conserved region of protein is available for binding. It has high capacity and provides good product recovery, as well as efficient removal of HCP aggregates or truncated forms. The ligand can also be used in secondary purification and polishing steps. Several factors should be considered for vaccines, some of which are often overlooked. “You need a holistic view of the process and what it will cost to do things internally,” he said, “including people, investments, and energy costs. It’s not a simple decision; it’s like a maze!” There is also a capacity issue. If your maximum buffer capacity is 2,000 L and a pandemic breaks out, you will be unable to ramp up vaccine production, but the alternative is to have large amounts of capacity unused the rest of the year. This is much less of a problem for biologic medicines, for which the demand is more steady.” As a result, Bushnaq-Josting explained, vaccine manufacturers are now increasingly moving toward outside preparation of their liquid products. Sarah Houlton, PhD, is a freelance science journalist based in Cambridge, MA, who specializes in pharmaceuticals, chemicals, and chemistry; sarah@owlmedia.co.uk.